An event isn't complete without tickets! First off you will need to click on the Event > Registration > Tickets tab at the top of your screen. Next we will click the blue button "+ ADD NEW TICKET". Next we define a ticket label (name) and ticket description - keep the name short and the description punchy! The maximum length for a ticket name is 40 characters, and the description is 500 characters maximum length. 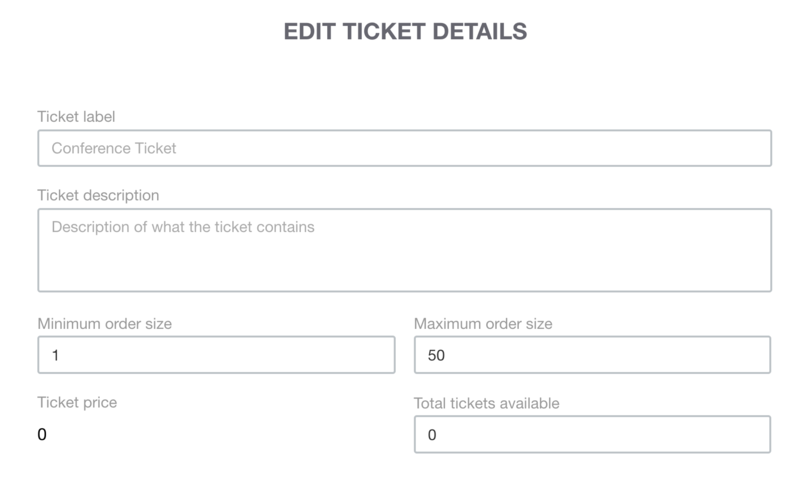 The order size fields allow event creators to define the minimum number of tickets that can be ordered at one time (usually 1) and the maximum number of tickets that can be ordered at one time (variable). Lastly, assuming this is a free event, we just need to enter the total number of tickets that we have available. In order for us to sell tickets, we must enter the number of available tickets. Click the green "ADD TICKET" button and then click on "SAVE CHANGES". Congratulations your ticket is created and you are ready to go ahead and start publishing your event! You can edit your tickets in the same way as adding them. It is important to note that Archiving a ticket will remove it from the event - any purchased tickets will be affected and will not show in your statistics and summary. Only archive tickets if none have been sold.